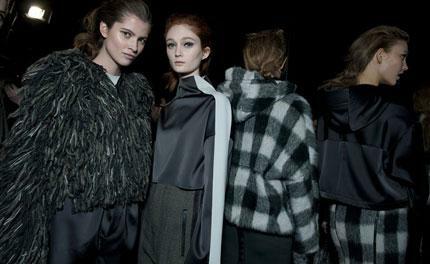 Rag & Bone's brand of covetable cool is alive and well. From the doughnut bar at the entrance of the show (doling out bite-sized chocolate, green apple cider sugar and cinnamon covered morsels), to the body-skimming crepe dresses and jumpsuits that hugged every curve, designers David Neville and Marcus Wainwright continued to satiate all our appetites. The label's trademark rebellious chic was mixed with more androgyny this season, with bowling shirts embroidered with models' names, boxy moto jackets and languid satin track-pants, all getting a look in. Outerwear, as always, was a winner. From funnel-necked mohair coats in cosy cocoon shapes to tailored Prince of Wales wool blazers and evening coats with contrasting leather lapels, there were options aplenty. The duo also experimented with patterns, such as hand-painted splatters that adorned skirts and trousers, and marbled Coogi knitwear (produced with the 1980s Australian brand) - another memorable success.